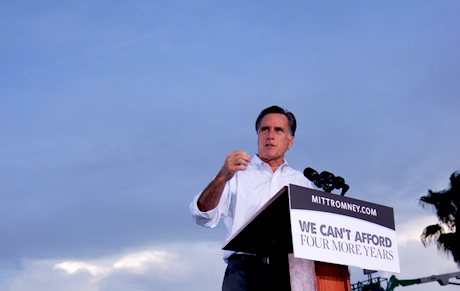 Romney addresses supporters during a campaign rally in Florida. Demotix/Warren Leimbach. All rights reserved. Perhaps because the Romney campaign has not achieved the desired traction from attacking Obama on a variety of foreign policy issues, the Republican candidate has turned to defence as a way to burnish his neo-conservative credentials and distinguish himself from Obama, promising, among other things, to significantly increase the share of the national budget assigned to the military. For the past sixteen months Romney has campaigned on the extreme right using the neo-conservative strategies of his advisers, before he recreated himself, once again, as a moderate conservative (presumably for the purposes of the November elections). Clearly, post-election reality would force Romney to nuance some of his more belligerent foreign policy pronouncements and he would be constrained by public opinion, partisan politics, Congress, executive departments and, above all, the exigencies of geopolitics. Nonetheless, there are many reasons why we should take at face value Romney’s earlier – rather than his recent – declarations on foreign policy. Foreign policy is always an electoral issue in the US, a country whose global military power and reach are historically unprecedented and far exceed its fading economic and diplomatic clout abroad. It is the one area in which a president can operate with fewer constraints from the other two branches of government and can establish his image as a statesman – which will be especially necessary for a new and relatively inexperienced occupant of the White House should Romney win the election. Playing a role on the world’s stage is a way to mark a presidency’s early trajectory – especially in the current post-financial crisis climate, if the economic recovery is slow and unemployment remains high. Foreign policy and national security remain strong suits of President Barack Obama and in polls over the past year he has enjoyed a considerable lead over his Republican challenger, Mitt Romney, in these areas, as opposed to his struggles to defend his weaker record on the economy. Yet the vote on 6 November 2012 will not turn on foreign policy: the economy still remains the critical issue for US citizens, along with the debates over tax policy, budget deficit and national debt. Moreover, the prevalence of social and religious issues (Obama’s health-care plan, abortion, gay rights and marriage, the role of women, and religion) for the Tea Party and the ultra-right base also skews the emphasis away from international issues (with the occasional exception of Israel). The Republican convention, for example, did not mention Iraq or Afghanistan-Pakistan even once, and this was not far from reflecting the public’s attitude. When he has addressed foreign policy, Romney has spent more time attacking Obama – sometimes in a gratuitous fashion – in terms of what Republicans see as generic Democratic weakness on national security and defence and tolerance for perceived enemies than in defining substantive and detailed differences with the president. The questions remain as to the extent to which there will be continuity or change in a hypothetical Romney presidency – is it the real Romney we are seeing in his speeches and position papers, or not? How much of the rhetoric was designed for the Republican right in the primaries and how much moderation is currently feigned for the general election? We might glean some inferences from the critique of Obama he has first offered broadly and later more intensely over Libya, and then speculate based on some assumptions about how closely presidents follow their campaign rhetoric and positions once in office. Mitt Romney and his vice-presidential running mate, Paul Ryan, have publicly castigated Obama for supporting the reinstatement of the democratically elected Honduran president because he “supports Venezuela’s Hugo Chavez”; for his ambivalence toward Benjamin Netanyahu and his treatment of “our ally Israel with an indifference that borders on contempt”; and for his initial engagement with Iran and North Korea, which Romney claims only emboldened them. The challenger has declared that he, unlike Obama, would draw a red line to stop Iran at the point where there is a suspicion that it has acquired “a nuclear capacity”, not just when it is about to make a bomb, and has reproached Obama for the timing of troop withdrawals from Afghanistan – and for announcing a timetable in the first place. Similarly, he has accused the president of mistakes in the Middle East, of sending mixed signals to the “Arab Spring” movement, and of timidity and abandonment of the dissidents in the course of Syria’s popular uprising against President Bashar al-Assad. Romney has argued for taking a harder line with Islamic fundamentalist groups like the Muslim Brotherhood, an even stronger backing of Israel in its present course, staying the course in fighting the Taliban and arming the Syrian opposition. Before the campaign had even begun in earnest, Romney charged that Obama had been ingenuous in his relationship with Russia, particularly in signing the New Strategic Arms Reduction Treaty (New START), which Romney in 2010 asserted might be the president’s “worst foreign policy mistake”. Romney proclaimed operatically that Russia “is without question our number one geopolitical foe” and argued that in the president’s eagerness to pursue nuclear disarmament, he had been out-manoeuvred and “badly out-negotiated” by the Russians into abandoning the US Europe-based missile defence programme. Obama, he stated, with more than a whiff of hyperbole, “obtained nothing whatsoever in return”. The Republican candidate has also hammered away at the administration’s tolerance of Chinese transgressions in trade and the financial markets, and vowed that as president he would condemn China as a currency manipulator. But in each of these cases Obama’s record, while debatable, is hardly one of weakness. In addition, Obama has taken the fight to terrorists in his expansion of the drone programme in Pakistan and North Africa to target suspected militants, and in his pursuit and killing of Osama bin Laden. Apart from the committed extreme right, there has been until recently no broad public perception of Obama as particularly vulnerable on defence and security issues. None of this affords an easy or clear-cut response from the Romney campaign; in fact, when Romney’s critique, including the slogans and bluster tossed about on the campaign trail, is inspected and parsed, the result appears to be devoid of many specifics and a well-defined direction in foreign policy. Elaboration reveals a continual vagueness and blurring of the lines about what Romney would do, and his disagreements with Obama’s positions seem more a question of fine distinctions than matters of substantive differences. Perhaps because the Romney campaign has not achieved the desired traction from these foreign policy issues, the Republican candidate has turned to defence as a way to burnish his neo-conservative credentials and distinguish himself from Obama. Indeed, there are serious differences and little doubt that a Romney presidency would favour a continued military build-up and enhanced global projection. Perhaps the core of his differences with Obama on foreign and defence policy is to be found in his approach to the military budget – especially appropriations for the US Navy. He has characterised Obama’s plans for the Pentagon as being under-financed and weakening US national security and strength abroad. The Republican challenger’s proposal would eventually raise the Pentagon’s budget to four percent of the nation’s gross domestic product, adding some $2 trillion to military spending, nearly double the amount proposed by Obama. Romney’s military budget would also include investing more in missile defence and restoring the 100,000 army troops and marines Obama plans to cut. A signal success for Obama was Libya, where a year ago the US played a key role in the NATO campaign that led to the toppling of dictator Muammar Gaddafi. Oddly, it was Libya that at the eleventh hour finally provided the opening Romney was looking for to make an effective case for the shortcomings of US foreign policy under Obama. On 11 September 2012 the US ambassador and three other American diplomats were killed in a deadly attack on the US consulate in Benghazi in Libya. The administration’s responses over the next two weeks were “not optimal”, as Obama himself admitted. However, Romney’s responses offer a miniature template on which we may project a future Republican administration’s approach to international affairs. The first point is that Romney’s initial reaction – deemed disgraceful by Democrats – was to fire off an intemperate and, as it turned out, baseless accusation that Obama sympathised with the attackers in Libya and had even apologised to the perpetrators. This was in keeping with the campaign’s allusions to Obama as an apologiser for America. The campaign’s 2011 white paper, “An American century: a strategy to secure America’s enduring interests and ideals”, charges that “President Obama issued apologies for America in speeches delivered in France, England, Turkey, and Egypt, not to mention on multiple similar occasions here at home”. This is a mantra trundled out since Romney’s defining foreign policy speech at The Citadel in October 2011, when he asserted with dramatic emphasis: “and I will never, ever apologise for America.” Romney’s response to the incident in Benghazi suggests his tendency toward extremism in the pursuit of political office and political gain and his campaign’s recurrent foreign policy theme: that Obama is feckless and naive abroad and has steadily weakened the US global position. Obama is wont to nuance US relationships with adversaries; a Romney administration’s foreign policy, on other hand, would be much tougher in defending US interests abroad and less ambiguous in dealing with perceived enemies or hostile forces or movements – especially in the Muslim world. The second point is that the Romney team spent the next two weeks projecting a picture of typical Democratic ineptitude and weakness on security issues, denouncing the administration’s long-delayed public response in identifying the attack as a organised terrorist operation rather than a spontaneous mob reacting to a video that was offensive to Islam. The campaign and other Republican stalwarts continued to accuse the president of misleading the public over the attacks in order to protect – in their view – his “exaggerated boast” of having made great strides in neutralising al-Qaeda. They also pointed to the lack of security (despite the fact that Republicans have pushed for heavy cuts in security for the State Department) as further evidence of Democrat weakness on national security. But the Republican gambit was an unabashed attempt – not having had much success before – to question the administration’s record of chasing down and killing terrorists, including Osama bin Laden, and to counter Obama’s relatively strong position on national security with voters. This goal looms as more pressing still, given the vulnerability of the Republican candidate because of his inexperience in international affairs. Both reactions were classic neo-conservative stances towards anyone not sharing their worldview. For a candidate who flaunts his image as a practical businessman, Romney curiously abandons the rhetoric of common sense and realpolitik to mimic the romantic foreign policy idealism of the neo-conservatives who surround him. He has by and large ignored the realpolitik wing of the party (Brent Scowcroft, James Baker, etc.) in favour of unreconstructed neo-con advisers notorious for authoring or contributing to the Bush administration’s disastrous blunders in the Middle East and South Asia. Some 17 of his 24 foreign policy advisers are considered neo-cons or hawkish left-overs from the Bush administration and who so far seem to have provided him with his talking points. The third point is that Romney’s blunder in precipitously blurting out his accusation against Obama immediately after the attack underscored a defect that has become something of a hallmark of the Republican candidate’s unscripted comments on foreign policy. In his rather conventional trip last summer to Britain, Israel and Poland, on several occasions he appeared gaffe prone, undiplomatic and somewhat demagogic. International affairs is an area in which his lack of experience leads to the risk of mistakes. Inexperience also raises the importance of these errors in the public’s mind in the absence of an established track record on the issues, since he has been the public spotlight over the past year. The impression given is that Romney specialises in posturing and opportunistically politicising as a first response, while only thinking through the implications later, if at all. Many wonder whether his improvised remarks when left unscripted are a permanent characteristic of his behaviour or a product of someone on a steep learning curve – and how much of it represents his true feelings. Clearly, post-election reality would dictate that Romney nuance some of his more belligerent pronouncements (e.g. on Russia, China and Iran), as indeed he has already done when asked to elaborate on his position to move against Iran when it nears a vaguely defined “capacity” for nuclear weapons. Moreover, while the president has marginally more authority in foreign policy than in domestic affairs, his freedom to act is constrained by public opinion, partisan politics, Congress, executive departments (the CIA, the Pentagon, etc.) and, above all, the realities of geopolitics. 1. There is an historical dynamic that often, although not always, operates for both Democratic and Republican presidents: conservatives like Richard Nixon or Ronald Reagan are politically freer to make moves toward the centre or even produce progressive breakthroughs in foreign policy than Democrats. However, Romney does not have the solid conservative credentials to be axiomatically backed by the faithful, unlike, for example, Nixon, who achieved an opening to “Red” China with virtually no right-wing opposition. Romney therefore will not be secure enough to move easily away from positions on the extreme right. 2. Romney’s personal history of shifting positions undermines his ability to navigate beyond the rhetoric on foreign policy issues he has employed to win the primaries and potentially the election. There would likely be heavy political costs of modifying his stance; therefore, the safe political course will be to write his record in keeping with his party’s message and avoid appearing devious and dishonest. 3. Romney is currently beholden to the party’s right-wing base for having come this far and will be even more so if he wins the presidency. In return, the Republican base can be expected to exert considerable pressure on him to toe the Tea Party line, which is more domestically oriented, but includes a tough national security and defence policy. He is unlikely to disappoint them. 4. There is the very tangible factor of the people he has selected as his campaign advisers on foreign policy and who will undoubtedly fill many of the key positions in defence, national security and foreign affairs in a Romney government. These include some of the most conservative and even extremist elements of the party, who have made their hawkish views well known and can be expected to push their agendas. 5. Foreign policy presents an opportunity for Romney to establish himself with the right wing of the party without incurring as much opposition in Congress, the media and public opinion as would be the case when carrying out his fiscal and social programme proposals. It is unlikely that he would see any advantage in making his mark as more liberal than he portrayed himself in the campaign in an area where he can more easily acquire conservative credibility and score key bragging points. The conservative domestic agenda is trickier and more problematic, and affects US citizens directly. If it is slowed or he must backtrack on domestic issues, unless he has a dominant Republican Congress, he can claim Congressional and internal political opposition as the reasons for his difficulties, but it will be harder to explain backtracking on the militancy he has expressed in foreign policy. Even if compelling international factors were interposing themselves, any shift in the “America First” chauvinism he has evinced in the campaign would reinforce his deserved reputation of changing positions for opportunistic gain. If there is a Romney administration, how conservative his policies may turn out to be will hinge on the complexion of Congress. If it is overwhelmingly Republican, we can expect his domestic agenda to be the place where his basic ideological orientation will play itself out. If, on the other hand, domestic politics is complicated by a credible opposition, it will be in the international sphere where Romney can make good on his campaign rhetoric. Given the odds, he will probably do so. This article was first published at Norwegian Peacebuilding Resource Centre (NOREF).